"These nuts are to die for! I do not like spicy food and I love these. My mom gave me this recipe and I am now making them on a weekly basis!" Whisk egg white in a medium bowl until frothy. Mix in cashews until coated. Let soak for 30 minutes. Preheat oven to 250 degrees F (120 degrees C). Line a baking sheet with aluminum foil. Combine sugar, cumin, salt, and cayenne pepper in a small bowl. Pour over cashews and toss to coat. 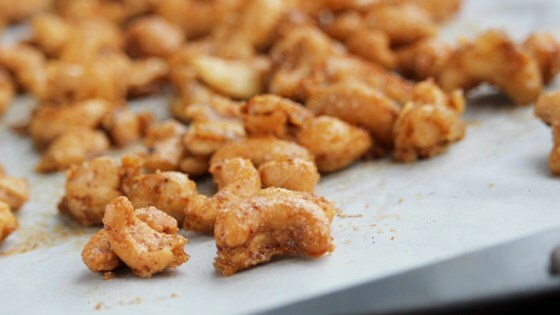 Spread cashews on the prepared baking sheet. Bake in the preheated oven, stirring halfway through, until fragrant, about 40 minutes. Reduce oven temperature to 200 degrees F (93 degrees C). Continue baking, stirring every 20 minutes, until cashews look dry, 30 to 40 minutes. Transfer cashews to a container and let cool, shaking or stirring occasionally to prevent them from sticking together. Learn all about spicy cayenne pepper. We store our cayenne cashews in plastic containers so that we can shake them while they are cooling. Make sure they cool with the lid off. Addictive! I don't care for sweet flavors but here, the sweet and spicy balance perfectly. Thank you for the recipe.